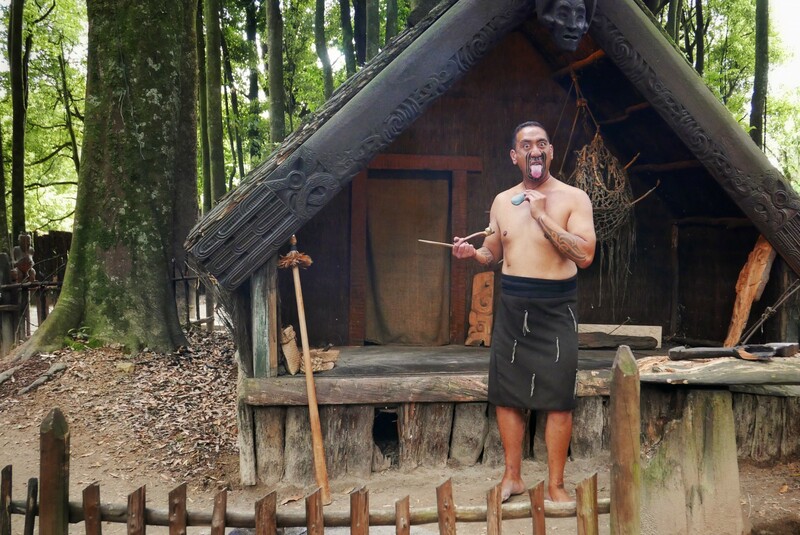 Tattood maori warriors, ceremonial rituals, and cultural performances were all part of our entertaining visit to the Tamaki Maori village. It’s an event that is obviously arranged to suit tourists, but that being said it is also a very interesting performance, and a meeting with a warm and welcoming people that put their hearts into the show.Mads participated in a training of new warriors – he clearly loved it as you can see below. 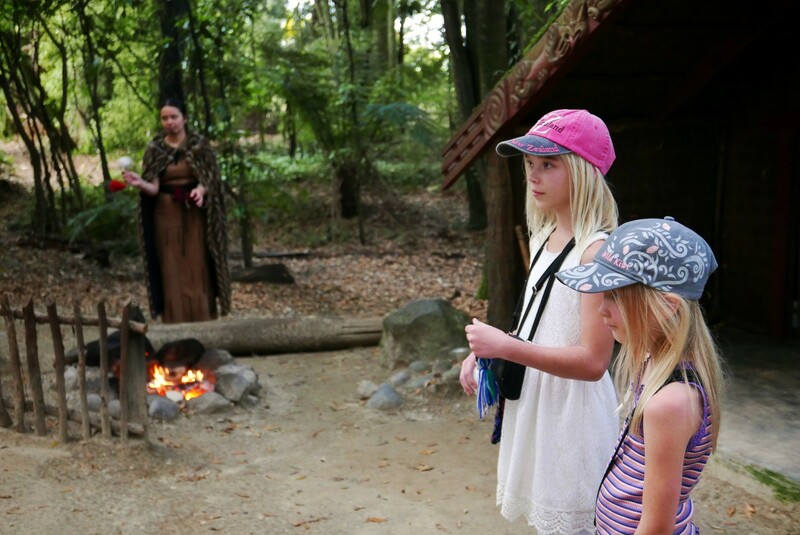 They were taught the traditional Maori war dance, the ‘haka’, and the girls had a try at the poi, a type of round drums that are swung around in the air in different ways. 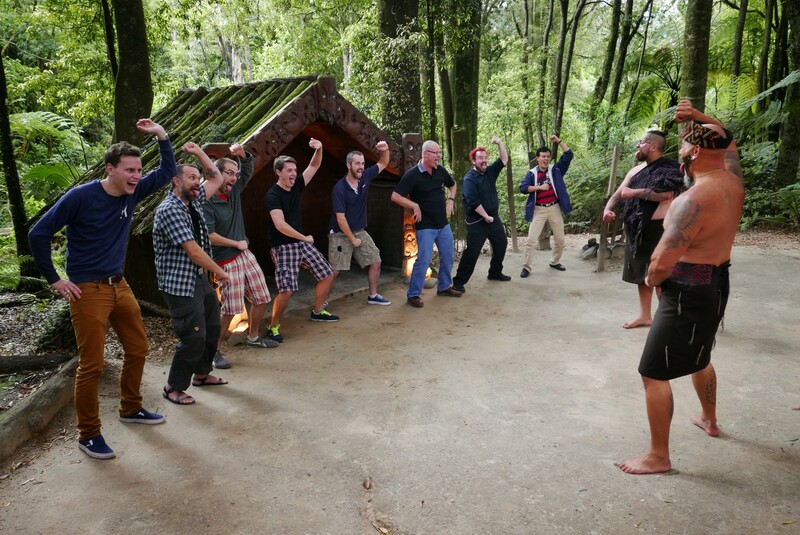 The evening was rounded off with a traditional Hangi feast, before we were taken back to our camp site. 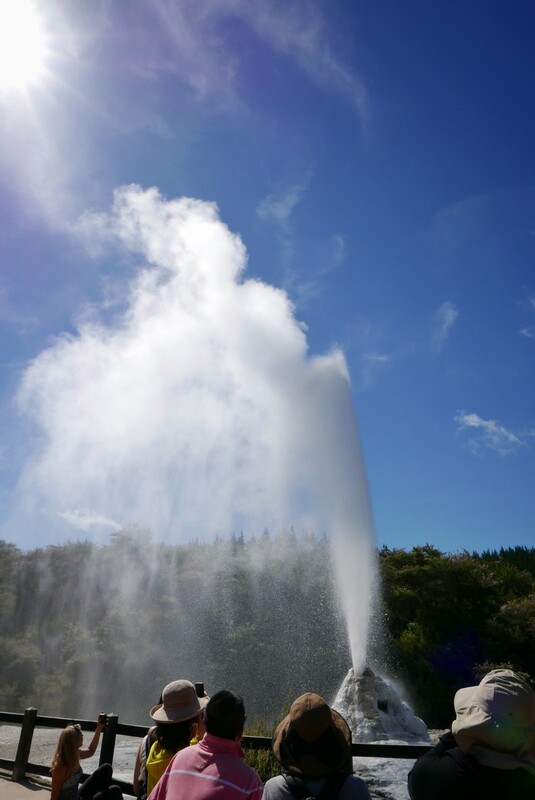 The following morning, we left early to see the Lady Knox geyser and go for a walk at the Wai-O-Tapu thermal area. The geyser was definitely fun to see, but in order to make it go off every 24 hours, they provoke it by adding a chemical. I don’t know if this is how it’s done with geysers that entertain an audience, but it felt a bit like cheating to me. Still, the geyser naturally goes off in a cycle that’s anywhere from 36 to 72 hours, and we probably wouldn’t have waited that long. 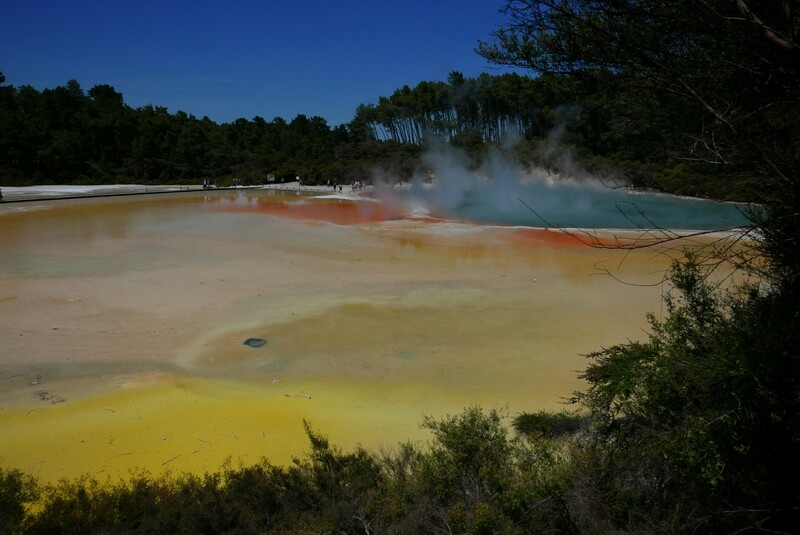 For us, the main attraction of the park was definitely the Champagne Pool which due to all the different minerals contained in the pool reflects all kinds of different colours in unbelievable patterns. After our walk in the park, we jumped in Børge BumleBus to move on to Tongariro National Park – everyone with great expectation. 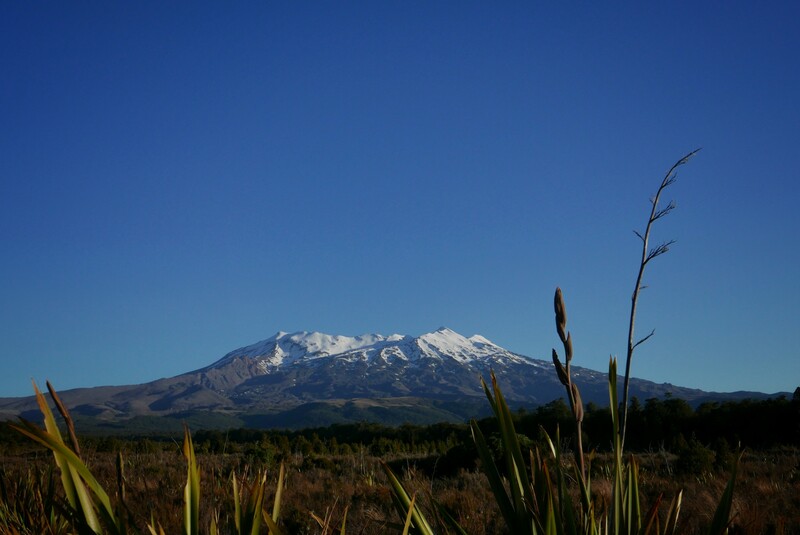 The drive there offered several fine scenic views – and a walk around Huka Falls. 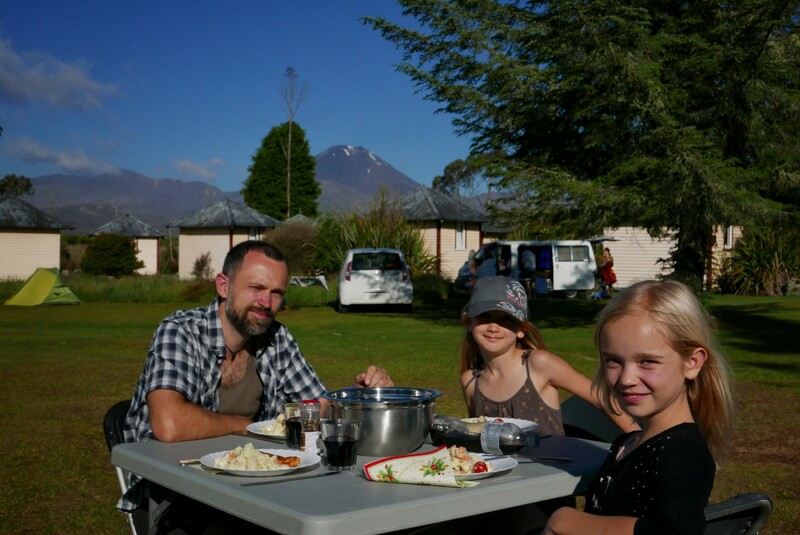 We arrived at Discovery Lodge in the afternoon with beautiful weather to get a good look at the mountains – with any luck – we would be spending our next day in. 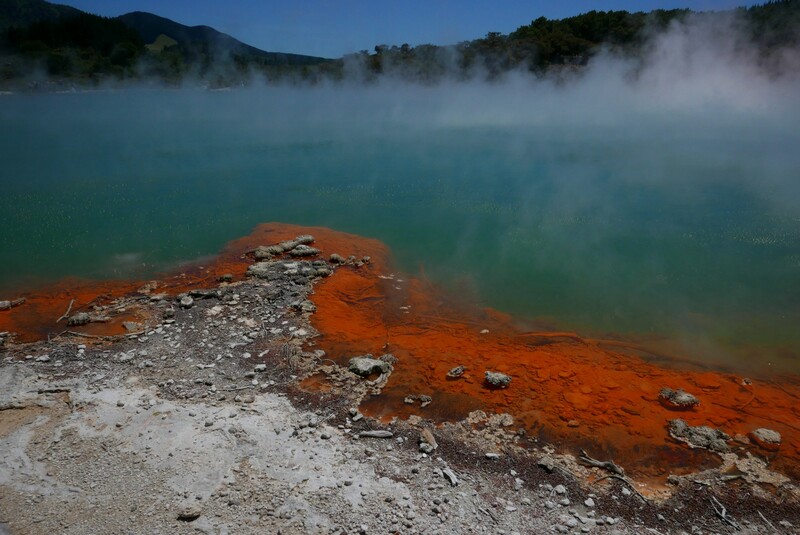 This entry was posted in New Zealand, Travel and tagged champagne pool, geyser, haka, hangi, maori, Rotorua, tamaki, tamaki maori village, wai-o-tapu.